Now I suspect you’re trying to give me a headache. BP: it would be inaccurate to say that the environmentalists were wrong about “the damage would last for decades.” Those environmentalists who said, “The Gulf will be a dead zone for 20 years” were clearly (and thankfully) wrong. But the BP spill was essentially an uncontrolled experiment on the ecosystem of the Gulf, and the only information we have about its long-term effects is what we can predict now — better information than a year ago, but still not good. Last I heard, the ecosystem essentially lucked out in that there were natural petroleum phages that ate the hell out of the oil. These phages apparently bloomed when the petroleum was plentiful, and died out afterwards. That implies that their waste products and remains are now what’s more plentiful by an order of magnitude or so. Effects of that remain to be seen. Wall Street: my tongue is bleeding from biting it so hard, but I can’t resist one question. 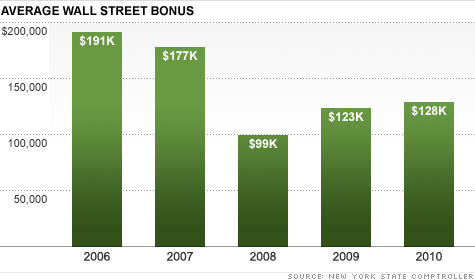 If you think that an average bonus of $100K is appropriate for 2008, under what circumstances should no bonus be paid? @Jeff: my point really wasn’t whether or not the environmentalists were right or wrong (or why). It was that both the private and public sectors did the right things here and got a positive result. We tend to bury those stories, but put the failures of both on the front pages. As for Wall Street, no bonus should be paid when the employee is given his full compensation as salary. If you’re going to give 30-50% (I don’t have statistics, but that’s what I’ve seen over the years) of someone’s pay to them in a lump sum, then you should only cut that portion to zero if your intent is to only pay them 50-70% of their expected pay. Also of note: since 2008, there has been a significant increase in the number of people that get $0 bonus on Wall Street, particularly at the most senior levels. In 2008 itself, most senior management teams (CEOs and their direct reports) voluntarily set their bonuses to $0 (which reflected the standard factors that go into bonus calculation: performance of the industry, performance of their firm, and their own performance, but also reflected the immense political pressure of the presidential campaign at the time). Since then, the “meme” has been that after the crisis, Wall Street went right back to paying super-high bonuses, while the economy remained stagnant and unemployment remained high. I thought this was a clear & concise way of showing that this wasn’t (and isn’t) the case.